A long time ago, in a university not far away, this MIT physicist hatched a plan for a bold experiment in space. Now, $1.5 billion and nearly two decades later, it’s finally time for one last adventure: Unlocking the deepest mysteries of the universe. All the way to every horizon, the whole day shines. The sand of the distant beach and the foam of the waves breaking on it. The white birds circling above, and, like opposites, like angels from alternative universes, the vultures, black and resonant, drifting in their higher orbits. Even the sky itself, a brilliant blue that seems to extend all the way to the Azores. Looking out from atop the gantry at Pad 39A at the Kennedy Space Center, the immediate universe seems suffused with a common luminance, except for the vehicle, standing there stolid in the full spring sunshine. There is something charming about the fact that it does not sparkle the way the rest of the day does. Built in 1991 to replace the doomed Challenger, Endeavour is still the newest of America’s space shuttles. On this day, it’s being prepared for its final flight, the second to last of the entire shuttle program. Endeavour looks old and worn, dinged and scarred. Its hull, once gleaming and white, is scorched to a dull gray in long streaks along its side and seared to black around its tail. It has to it the aspect of one of the old pickup trucks you pass along State Road 405 on the way down to the space center, their wheels half on the highway and half on the shoulder, their drivers disappeared into the scrub and brush to hunt alligators, or wild pigs, or bales of dope dropped off by runners from the Bahamas. If the space center looks like the realization of what Florida hoped itself to be, the Florida that attracted generations of dreamers stretching from Ponce de Leon to Walt Disney, then the Endeavour, there on its pad, awaiting its last trip into space, looks like a bit of the cobbled-together Florida that always was. The shuttle may be a triumph of technology, cousin in its own way to the Corvettes that the space jockeys used to run recklessly along the shining beaches, but it still has about it the feel of something a mechanic would drive to work. If all goes according to plan, Endeavour will lift off for the last time on April 29, its historic mission designated STS-134. The launch has already become an event for reasons far beyond the fact that it will be the vehicle’s final one. The commander of STS-134 is Mark Kelly, the husband of Representative Gabrielle Giffords, the Arizona congresswoman who survived an assassination attempt on January 8 in Tucson. Kelly has said his wife is planning on coming to the launch, and this has set off something of a feeding frenzy for the NASA press people to deal with. So STS-134 already has a bit of a celebrity sheen to it that might well blind folks to what Endeavour actually is going to be doing, which is what all good trucks do at one point or another: It will be making a delivery, dropping something off on behalf of the puckish 75-year-old gentleman who’s also up on the gantry, taking the air on this fine afternoon, and looking down at the vehicle that will rocket into space not only the machine he’s been building for almost 17 years, but also the hopes and dreams that are as much a part of that machine as its circuitry. On the faculty at MIT since 1969, Samuel Chao Chung Ting arrived in Cambridge after a gypsy childhood that saw him bounce from Michigan to mainland China and thence to Taiwan. In the mid-1970s, Ting conducted experiments through which he discovered a new subatomic particle, one which upset the entire field of particle physics and, in 1976, earned him a shared Nobel Prize. 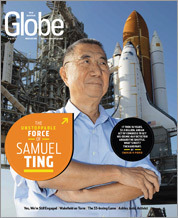 It was five years before the first space shuttle ever left the pad, and Sam Ting’s professional reputation was completely secured. There are people who would have coasted on a Nobel. There are people who would have spent the next 40 years talking about their first 40 years. There are people who would have gone to the beach, but Sam Ting did not go to the beach. He went back to work. Starting in 1994, he threw himself into a project he called the Alpha Magnetic Spectrometer (AMS), a device of nearly eight tons that would be attached to the International Space Station. Essentially a giant magnet for sifting apart the particles in cosmic rays, the AMS will look for evidence of the mysterious dark matter that some physicists believe makes up more than 80 percent of the matter of our universe. “Our universe” is, of course, an interesting term, because it implies that there are other universes (perhaps even “their universe,” which is somewhat boggling). Our universe is composed almost entirely of matter, and one of the great mysteries of the cosmos is what happened to the equivalent amount of antimatter that most physicists believe must have accompanied its creation. Ting’s AMS is also going to be looking for traces of this primordial antimatter in space – one particle could be enough to provide evidence of an entire antimatter universe all its own. Finding it, though, one of Ting’s colleagues has said, will be like standing in a rainstorm and finding the single drop that is different. So, in essence, Sam Ting will be trying to accomplish the near impossible, seeking out nothing less than the building blocks of the universe, listening for the oldest, deepest echoes of the big bang that created everything. Those who did know Ting, though, never doubted he would find a way to get AMS back on the shuttle manifest, and from there into orbit. The man is famous for his iron will, after all, which helps explain why, today, on a perfect spring afternoon, Sam Ting is up above it all and everything seems to be shining at once. He had no formal schooling as a boy. He remembers spending a lot of time playing in the fields. “School,” he says today, “was not a priority in my life.” At home, however, his parents, who were by then both university professors, filled him up with stories about Michael Faraday and James Clerk Maxwell and Isaac Newton, and all the great scientists. These fired his imagination. “I was always quite curious,” he says. “When I was young, I didn’t know what I wanted to do, but I knew I wanted to be a scientist.” In 1948, as the Chinese civil war turned in favor of the communists, the family moved to Taiwan, and Ting’s schooling finally began in earnest. Eight years later, Ting won a scholarship to the University of Michigan back in his old hometown. He arrived at the Willow Run airport outside Detroit with $100, because that seemed to him to be a lot of money. Hungry, he bought a hamburger and was dismayed to learn it cost him a whole dollar. He left for campus with $99 and the beginnings of a serious case of culture shock. He didn’t speak much English. He didn’t have winter shoes. He’d enrolled in the engineering school because its dean, an old family friend, had offered him a free room in his house. However, Ting gradually became acclimated. One of the ways he made himself into a Michigan man was to attach himself to the university’s football program, to which he remains a fervent acolyte. He returns to Ann Arbor once a year for a game at The Big House, and he wears his NASA ID around his neck on a “Michigan Wolverines” lanyard. What Ting couldn’t do at Michigan, however, was make himself an engineer. He had no gift for producing technical drawings or for reading them. Instead, on the advice of several faculty members, he changed his academic emphasis to a combination of physics and mathematics. He whipped through his undergraduate work in three years and attained his doctorate in 1962. He then went to Geneva on a Ford Foundation fellowship and found work at CERN, the European Organization for Nuclear Research. That began a relationship that continues to this day; CERN is where the components of the AMS were assembled. From the start of his career, Ting’s curiosity often rubbed up against scientific dogma. In 1966, while he was working in Hamburg, one of his experiments overturned a decade’s worth of other scientists’ work in quantum electrodynamics. This drew the notice of Burton Richter, a physicist at Stanford University who shared Ting’s impatience with what otherwise was considered settled science. It was perhaps not surprising, then, that Ting’s proposed experiment was turned down by several of the world’s major institutions. But he remained undeterred and finally found a home for it at the Brookhaven National Laboratory on Long Island, New York. There, in the summer of 1974, he found a new type of particle – he named it the J particle – that proved the existence of a fourth type of quark. Ting’s colleagues on the project wanted him to rush his results into print, but he insisted on checking and rechecking his findings in the methodical way that has become his trademark. Less than two years later, Ting and Richter were in Stockholm together, collecting their medals from the king of Sweden. Ting gave his Nobel banquet speech in Mandarin, the first one ever delivered in that language. The Nobel Committee specifically cited Ting’s powers of concentration, which enabled him to detect traces of the J particle amid the cosmic cacophony surrounding it, comparing the feat to “hearing a cricket close to a jumbo jet taking off.” Or, to put it another way, Ting was just the sort of man who could stand in the rain and pluck a single, special drop out of the air. What the experience taught Ting was that he could trust his instincts even when the scientific consensus was against him and that, properly designed, his experiments could find what nobody, perhaps not even himself, thought could be there. “The most exciting part,” he says, “is to probe the unknown, to search for phenomena that exist in nature that we have not yet had the tools to discover.” It was those lessons that Ting brought to his long struggle to get the AMS aloft. It also explains why, when he’s asked whether he’s stubborn, and he demurs, all of the other people in the room, most of whom have worked with him on the AMS for nearly two decades, find the whole thing remarkably funny. Ting began to think about experiments in space in 1993, when the United States canceled funding for the Superconducting Supercollider, a massive underground particle accelerator in Texas that would have dwarfed the 17-mile-long Large Hadron Collider now at CERN. Faced with such a setback, any other scientist might have reined in his ambitions. Ting resolved to dream bigger. Where the colliders sought to produce evidence of dark matter and antimatter artificially, he reasoned, the next logical step was to put something up in space to find them where they naturally occurred. In 1998, a simplified prototype of the AMS flew on Discovery on its final trip to Mir, the old Russian space station. The prototype worked well enough to prove that the magnet and detection instruments on the AMS would function in space. However, as the price of the AMS soared toward $1.5 billion, Ting’s critics grew louder. Ting’s project was questioned again in 2006, when a European consortium sent the Payload for Antimatter Matter Exploration and Light-nuclei Astrophysics (PAMELA) probe up from the old Soviet launch site at Bajkonur in Kazakhstan. PAMELA began producing results almost immediately, and there was some serious talk that the AMS would prove to be little more than an expensive amplifier of someone else’s work. Ting, however, persevered, as befits a man who, legend has it, once responded to a board’s rejection of one of his experiments by declaring, “I reject your rejection.” He shrewdly used his credibility to keep his project alive while, all over the world – including in Italy, France, Germany, Spain, Switzerland, and Taiwan – construction of the AMS components continued. He set up something of a satellite office at a hotel in Washington, D.C., and began pleading his case to any member of Congress who would listen. Ting had a number of arguments in his favor, not the least of which was his own eminence in the field. NASA had promised to carry the AMS into space on behalf of the Department of Energy, which saw NASA as reneging on a promise. Plus, Ting and his colleagues pointed out, the vast majority of AMS’s construction bills had been borne by other countries, so backing out would be an international embarrassment. Congress agreed and, in 2008, passed an act that required NASA to add a shuttle mission to take the AMS into space. In the meantime, the AMS and similar enterprises became an issue on the presidential campaign trail, with both Barack Obama and John McCain favoring scientific exploration over flashier, more utopian schemes like a manned mission to Mars. Three days after the Obama administration took office in 2009, another shuttle flight was officially scheduled and the AMS was made part of its payload. By the following spring, however, Ting was harboring serious doubts about the superconducting electromagnet at the heart of his device. Concerned that it would burn out after only three years, he decided to tear it out. This massive, last-minute change would require delaying Endeavour’s launch from its original July 2010 date. Ting installed the weaker, permanent magnet from the prototype that had flown on the 1998 shuttle mission. It meant the AMS could keep gathering information, to the tune of seven gigabytes per second, for more than a decade, as long as the space station remains in operation. You can’t see the sun or the sky or the steadily wheeling birds from the place where the AMS is being stored, in a clean room attached to the side of the gantry that will mate with the back of Endeavour so that the device can be transferred to the shuttle’s cargo bay. You can’t even see the people in the room, swathed as they are, top of the head to soles of the feet, in preposterously billowy “bunny suits.” The AMS, a huge, roundish thing, shaped not unlike a beer can, is itself draped in fabric, which gives it something in common with the people working on its final preparations. Bristling with the struts by which it will be handed off by the shuttle’s extendable cargo arm to the one on the space station, the AMS has “UNITED STATES” emblazoned on it, as well as a spiffy logo, and you can’t see it all unless you walk up two iron staircases to a third level of the facility. It will remain on Earth until April 29. And then Sam Ting, who oversees every little part of every one of his experiments, will watch it disappear into the sky, far beyond his ability to tinker with it anymore. Out of the stifling bunny suit and into the clear afternoon again, Sam Ting goes off to a meeting at another part of the Kennedy Space Center. His grand project, the product of deep imagination driven by prodigious will, stays behind in the clean room, halfway up the gantry and about midway up the hull of Endeavour, which will be going up for the last time this month, a launch that already is a media event because of tragic terrestrial circumstances in Tucson. The shuttle stands there, vertical and stolid, dinged and scarred, scorched and singed, while all around it, all the way to every horizon, the day continues to sparkle like something unknown is lighting the whole universe up, something undiscovered, something that might be limitless.